Fraley said I’m his beta-tester for all things cool…. Situation: Stereo in the Jeep is kapoot after 6 years of being exposed to, well, everything an off road vehicle with the top off 6-7 months out of the year would be exposed to. the Lisa Nit-Pick Factor: Do not want a cd player (dust n dirt and bounce factor). Do not need a bunch of fancy crap (no touch screens or dvd player, etc). Buttons must be minimal (dust n dirt factor). Ease of use is essential. (simple mind in use factor) Must play the ipod or whatever (tech factor). Negligable: Radio capability. Installability by consumer. 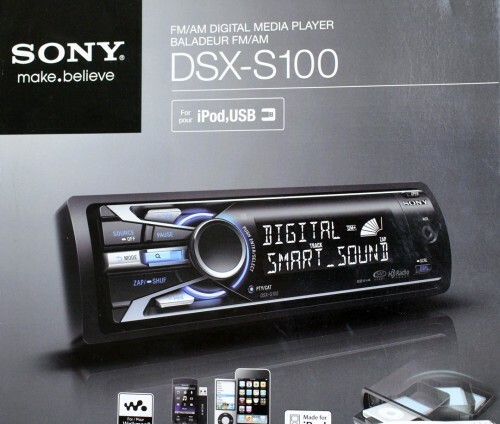 *Relatively inexpensive (as car stereos go) at $119.99. *ONLY PLAYS DIGITAL MEDIA. No flippin’ CD player. Who plays CDs anymore, seriously? Even if you have a multi-cd changer, an Ipod or mp3 player holds so much more and gives you endless variety that cds just don’t. I think we’re a few years off from this type of stereo becoming mainstream (people in the midwest, no offense to anyone in the midwest, are still watching movies on VHS), but this is exactly what I’ve been clamoring for years about being the obvious direction to go in. Especially in the Jeep. Off road it’s just too damn bouncy for CDs to play without skipping all over the place, and packing those suckers around and changing them out is just annoying. I have a lot of music, a WHOLE LOT, and it’s all on ipods. 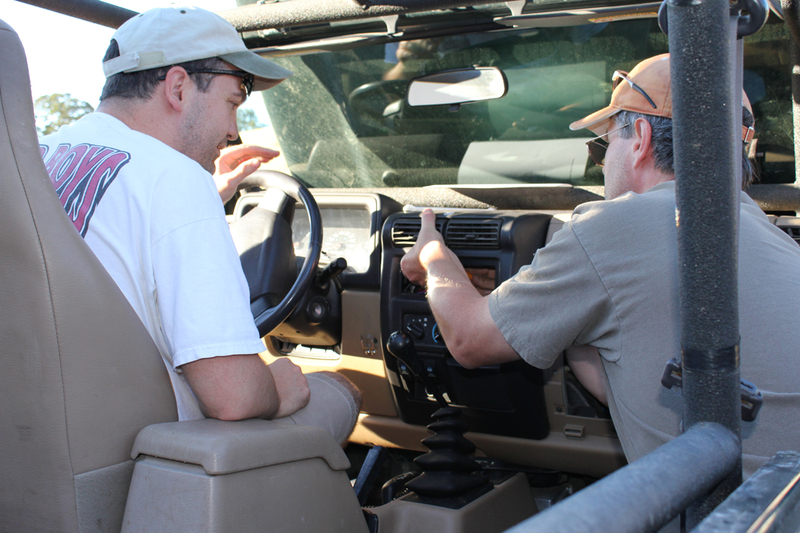 My Jeep comes with 2, count em, TWO engineers to install stuff! This is the dude I beta-test all things cool for! He drives a clown car (a Scion) and may just be more type A than I am. I think I love him. But not for those qualities. Nor when he puts his socks….not his socked feet mind you… just his socks, on my coffee table. Andretti adores him. And he helps Art the Husband focus, mostly by yelling at him. He makes me look like a kitten in comparison. 🙂 Paul Fraley, you’re my hero. Overall product review: Awesome. If you have a Jeep you mash around with, leave open, etc. this may very well be the perfect solution to your stereo wants/needs. If you have a regular car, it will still be perfect. Now…gotta go trail test it. 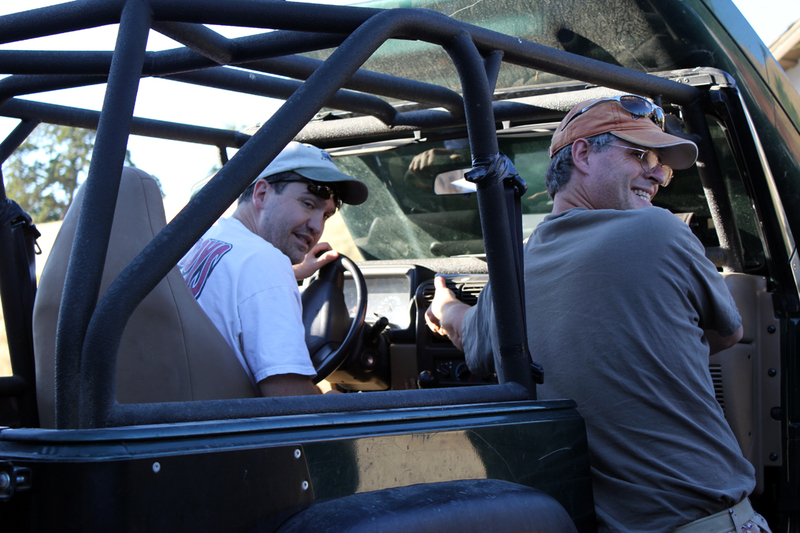 Sierra off road this weekend….woo hoo. I am the only one in the house that listens to CDs. Not sure why. Heck, i still listen to vinyl and would listen to tapes inf the player hadn’t broken. Don’t need a player in the car though. Not at all. I don’t think our new car has a player, but it has an audio jack for the mp3 player. And why does the double vision sunglasses? To lose another pair? which doesn’t explain his mindless random punching of buttons after it was all installed and up and running. Tsk. Boys.